Polishgenes Blog: What do you get when you cross a Frenchman with a Lithuanian? What do you get when you cross a Frenchman with a Lithuanian? We've turned out French-like. Sacrebleu! Let the wog flow through you. Yeah, see that's way too much culture for me. I just want, like, food that I can eat. Btw, are these detecting modern signals of admixture or ancient stuff? Admixture from within the past 4,000 years, apparently. Ironically enough, bouillabaisse should agree more with your heightened Hunter-Gatherer ancestry than the "meat and three veg'" you'd rather have. Bouillabaisse is a dish a seaside hunter gatherer would have likely made, while the latter is completely neolithic! Although if I understand well, the paper would imply that Poles are also partially Hadza, by Lithuanian proxy. You must be at advantage this crazy summer! More seriously, I hope that this website and paper don't get too much coverage. Is it being mentioned much in the mainstream press? Someone mentioned that it's very popular with the science press, but I haven't checked. You know, I really don't mind being part French, as long as it's not Parisian French. Nice terrorist beard, by the way. French+Lithuanian=Pole does make some sense because of the levels of EEF, WHG, and ANE in French and Lithuanians. If this study seriously thinks Poles are part French or part Lithuanian they are crazy. Well maybe some Gaulish tribes ran away from Ceasar and exterminated the native black and Hadza people in Poland, then Lithuanians who were the original slavs conquered Poland. This paper is starting to make a lot of sense, you just have to use your imagination. Damn, I am not surprised, it seems like the people behind this study put a bigger emphasis on media-friendliness with their website than on the quality of their research. Just like what happened with Elhaik's bung khazar study. As an unrelated aside, I have been working on my off days (not many) at making facial composites for the K15 components, I have found a software that allows graphic extrapolation. Northeast African = Ari - 10 % Yoruba - 10% Oromo (that's not the exact equation, but you get the idea), I can do the same equation using average faces. I have only done for a few components so far, but it's looking good. I'll keep you posted on the very slow progress. Also, as a Parisian, I completely agree with you. Hence, I don't ever intend returning to Paris. Ah, crap, I forgot you were from Paris. I was quiet estonished that it really made it into the mainstream media. Headline: "Scientists say, we are all mixed all over the place" - so why not get more migrants, we are mutts anyways? Same was recently with the mesolithic/mesolithic findings. There were some media people who interpreted La Brana-1's pigmentation results as prove European and African traits had not diverged yet and some said he was part African and part European. I wont to describe why they are wrong because you already know. First they have to define what European is and what African is anyways. I really did not like how the media presented La Brana-1. Everyone was mainstream no one was thinking outside the box, every article even on scientific websites said the same thing. Why didn't Laz 2013 get this attention? It was like the La Brana-1 paper x7. There were many articles online that said native Americans have European roots(They like racial controversy). Native Americans have some pre-Colombian west Eurasian ancestry(ANE) and their form of west Eurasian ancestry(ANE) may be most related to pre Neolithic Europeans(WHG). pre Neolithic European does not equal modern European. 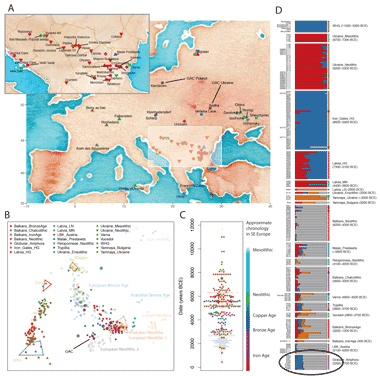 It(WHG) is very exclusive to Europe and makes Europeans distinct but most Europeans have more near eastern ancestry. The other connection is that most Europeans also have ancestry from ANE, but so do most near easterns, south-central Asians, and probably Siberians. Media people(online, TV, radio, etc.) will say "the experts said" and people are then brainwashed. The media looks for anyway to put down the right. Information people get is very biased. Who here thinks the media lead Americans(especially African Americans) into racial hate over the Zimmerman trail? I do!! How they presented Phil Robertson was terribly biased. They are brainwashing this country. They better stay away from Human genetics.